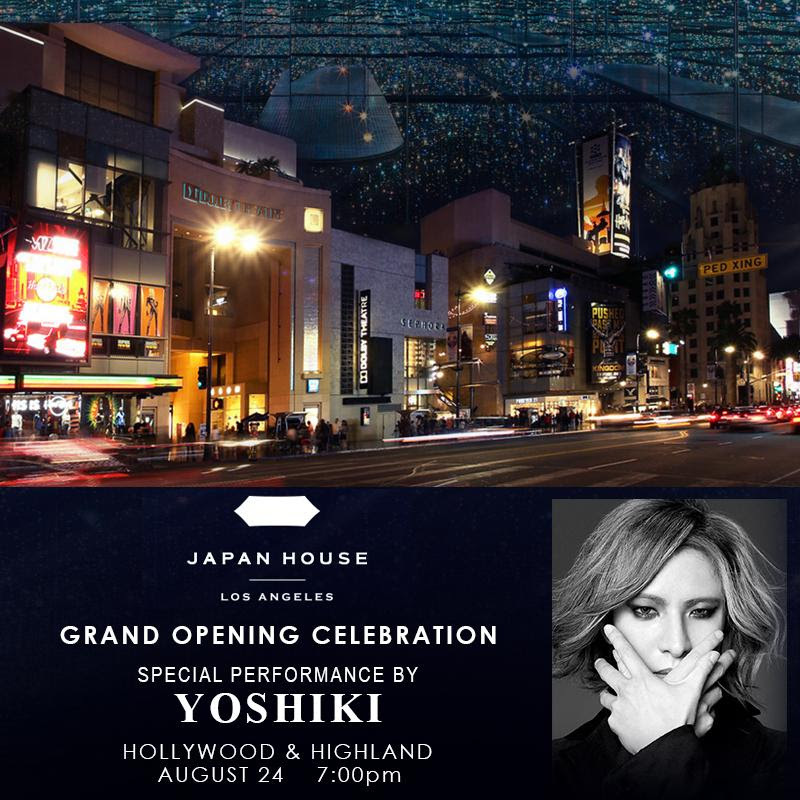 August 3, 2018 Los Angeles – YOSHIKI will create a special musical performance to celebrate the Grand Opening of Japan House Los Angeles at Hollywood & Highland on Friday, August 24th. Japan House Los Angeles is a premiere venue designed to showcase Japan’s art, culture, business, technology, and entertainment to help strengthen cultural ties between Japan and the world. YOSHIKIserves as an advisor for Japan House along with honorary advisor Larry Ellison. With facilities inLondon and São Paulo, this will be the first time Japan House will open its doors in L.A.
YOSHIKI has been invited to give a special congratulatory performance at the unveiling of the newly-completed facility, which will include a special cocktail reception and a seated dinner withinternational government, business and cultural leaders, including the Ministry officials of Foreign Affairs of Japan, the Consul General of Japan and celebrities. Demonstrating his commitment to the mission of Japan House, YOSHIKI personally made arrangements for a limited number of American fans to attend the private event in the unique, intimate setting in Hollywood. YOSHIKI announced the invitation today on his official Instagram, and applications for the rare passes surpassed the capacity limit just minutes after he posted the news:https://www.instagram.com/p/Bl_rOIEgI3H/.